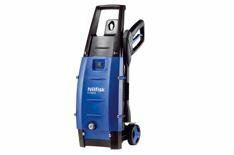 Nilfisk C110.3-5 X-TRA | What Car? Assembly of the C110.3-5 X-TRA was straightforward, with most of the elements being clip-and-lock. Two screws are required to attach the handle, but an Allen key is provided for the job. Detergent is added through a clip-on tank, and delivery of foam is quick and efficient. A rotary- and standard brush are supplied, along with two nozzles. The rotary-style nozzle is particularly strong and helps this machine achieve results that belie its budget price. Nilfisk's clip-and-lock system is particularly user-friendly and makes changing lances extremely easy and quick. Despite being a small and light machine, the five-metre hose made it feel stable and easy to use. It's a very quiet machine, too. The hose needs to be unclipped for storage on the onboard hook, but thanks to Nilfisk's clever clip-and-lock system this is not too much of an irritation. The power cable can also be wound on to the machine, while the lance and trigger fit neatly onboard, too. The budget Nilfisk is certainly an excellent multi-purpose machine and will be more than suitable for most domestic users. The standard accessories, clever design and strong performance make it a great buy at an even better price.